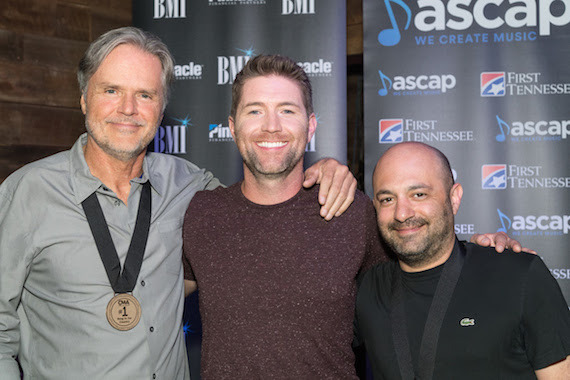 Pictured (L-R): ASCAP songwriter Marc Beeson, BMI artist Josh Turner and BMI songwriter Daniel Tashian. Nashville is a town where songwriters are rock stars. Nowhere was that more evident than at Monday’s (June 19) No. 1 party at Nashville venue SOUTH, to celebrate Josh Turner’s fifth chart-topper, “Hometown Girl.” The crowd’s ovation reached a fever pitch when Jody Williams, BMI’s VP, Writer-Publisher Relations, announced that “Hometown Girl” was BMI writer Daniel Tashian’s very first No. 1 song. In BMI tradition, Tashian was given a Epiphone guitar. “Hometown Girl,” recorded by Josh Turner, was penned by Tashian and ASCAP’s Marc Beeson. ASCAP’s Mike Sistad honored Beeson, who was celebrating his third No. 1 as a songwriter. Beeson has accumulated more than 100 cuts over his career, including songs recorded by Chicago, Martina McBride and Garth Brooks, as well as work on Billy Currington’s recent No. 1 single, “We Are Tonight,” Ashley Monroe’s “The Blade,” and Blake Shelton’s “She’s Got A Way With Words.” He’s earned 10 ASCAP awards for his pop and country songs. Turner, who recently celebrated his 150th performance on the Grand Ole Opry, thanked the MCA Nashville promotion staff for fighting for the song at radio. In particular, he thanked radio promoter Katie Dean for helping him to reshape his approach to radio. “Katie and I go back a long ways, and thank you for having the ears to know in the beginning that this song could be a hit. She spearheaded this movement and made it happen just a little bit at a time. She motivated the whole promo staff each week and rallied the support of radio in a pretty remarkable way. “She also changed my attitude toward promoting the song. For so long I had been in the mindset of battling radio and being in a war with radio to get the song played, but she helped me understand that we were working with radio, so thank you for helping me grow,” he said, before thanking the rest of the label’s radio promotions team. UMG Nashville CEO Mike Dungan, along with many from the label, wore blue sports jerseys emblazoned with “Hometown Girl,” and crafted by Richards & Southern. He honored the gold-certified, No. 1 hit with the label’s signature “impaler” awards. Pictured (Back Row, L-R): ASCAP’s Mike Sistad, Downtown Music Publishing’s Steve Markland, Big Yellow Dog’s Carla Wallace and producer Kenny Greenberg. 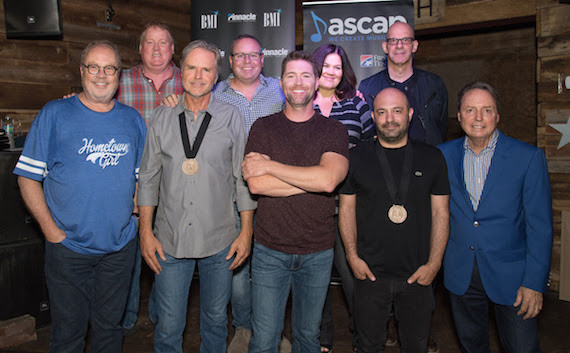 (Front Row, L-R): MCA Nashville’s Mike Dungan, ASCAP songwriter Marc Beeson, BMI artist Josh Turner, BMI songwriter Daniel Tashian and BMI’s Jody Williams. “Hometown Girl” producer Kenny Greenberg, who has been on the road for years with artists including Kenny Chesney, produced the track. Greenberg is married to singer-songwriter Ashley Cleveland. Fun fact: In the mid-1970s, Greenberg (then 21), played one of his first sessions in Nashville. He notes that on the same session was dobro player (and now BMI exec) Jody Williams. Downtown Music Publishing’s Steve Markland honored Beeson, while Big Yellow Dog’s Carla Wallace honored Tashian. The Country Music Association’s Brandi Simms and the Country Radio Broadcasters’ Holly Lane were also on hand to honor Turner, Beeson and Tashian. Pinnacle Bank celebrated the chart-topper with a donation to the Community Foundation of Middle Tennessee. First TN Bank was also on hand to honor the writers and artist. “When you are a songwriter, you embrace anyone who wants to record a song and you are grateful for that. But there are a handful of people that, in your mind, are kind of iconic with their sound,” said Beeson. “Josh has always been one of those voices to me and I’ve been trying to get a Josh Turner cut since he came to town.